Maybe you have been wondering why most of the famous blogs are using numbered pagination, instead of displaying older and new post buttons at the bottom of every Blogger archive page. From my experience it gives you better page views than the older and newer post button. It is more user friendly, attractive, and SEO friendly. I have been using number pagination on my blog for quite a while now, you can see it at the bottom of this post and in my homepage. In this article, I will show you how I added numbered pagination in my blogger blog. Numbered pagination is a numeric navigation menu which is usually present at the bottom of the archive pages. It divides your whole blog into different pages, just like the pages of a book. Users can simply navigate through page 1, 2, 3, 4 and etc. We have attached a screenshot above, so that users can easily understand my words. 2. Back up your blog using Download Full Template as a precaution in case you accidentally overwrite some code and are not able to retrieve it. 6. Once everything is done press “Save Template” button located on the top right corner of your screen. 7. Now go and check out your blog homepage to see the amazing navigation in action. You also do some little modification im CSS, anyone can customize to give it the desire touch that he needs. Congratulations: You have successfully added numbered pagination in blogger. 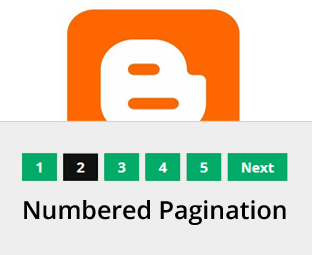 I hope this tutorial have helped you in learning how to add numbered pagination in blogger. If anyone find any difficulty then don't be shy to make use of the comment box below.